In 1837, the Republic of Texas made its first attempt at statehood, and after several failed attempts, it finally succeeded in 1845, making Texas the 28th state of the United States. Sixty four years later, a group of German and Czech businessmen hired brewmaster Herman Weiss, and with that, the Spoetzl Brewery, home to Shiner beer, Texas’ oldest brewery was born. 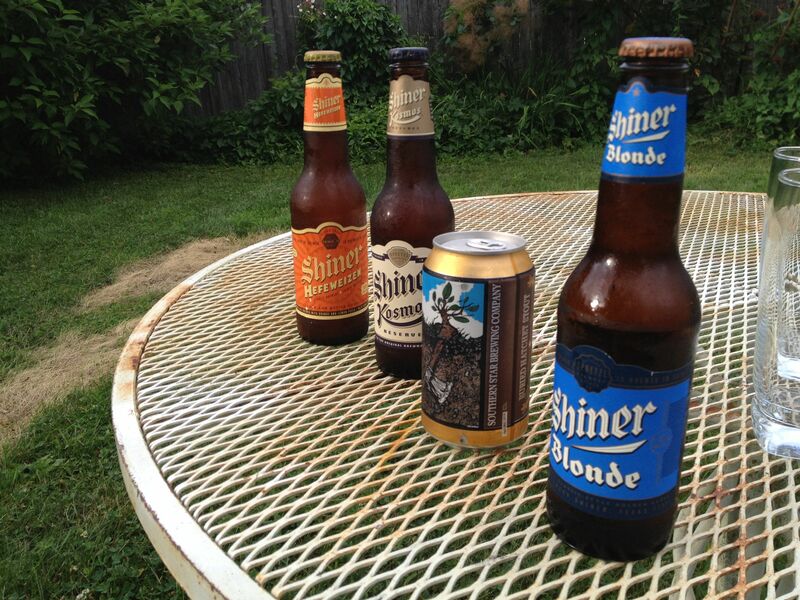 Shiner is a Texas legend. There are coffee table books about it, movie placements, and even mentions in Breaking Bad. But the reference that seems to occur most often is in lyrics, where it holds yet another legendary status. In 2012, Georgia country artist Jason Aldean signed a promotional deal with Coors which resulted in his changing of a song lyric from grab a little Shiner Bock to grab a couple Rocky Tops. Texas musicians have always liked to sing about their beer. In fact, the Spotzel brewery sponsored its own band, the Shiner Hobo Band, with the band getting paid 1 keg per performance. In 1947, Bob Willis and his Texas Playboys first recorded the song Bubbles in My Beer which was performed by many Texas musicians, including George Jones and Willie Nelson. Today, we skipped the Patrón and went with our 1 six pack of Shiner, the family pack, and to show off some other beer from the state, we also grabbed some Buried Hatchet Stout from Southern Star Brewing Company. My first experiences with Shiner were on the Riverwalk in San Antonio. On two different trips there, I had a nice portion of Shiner Bock. Finding Texas beer in New England is hit or miss. 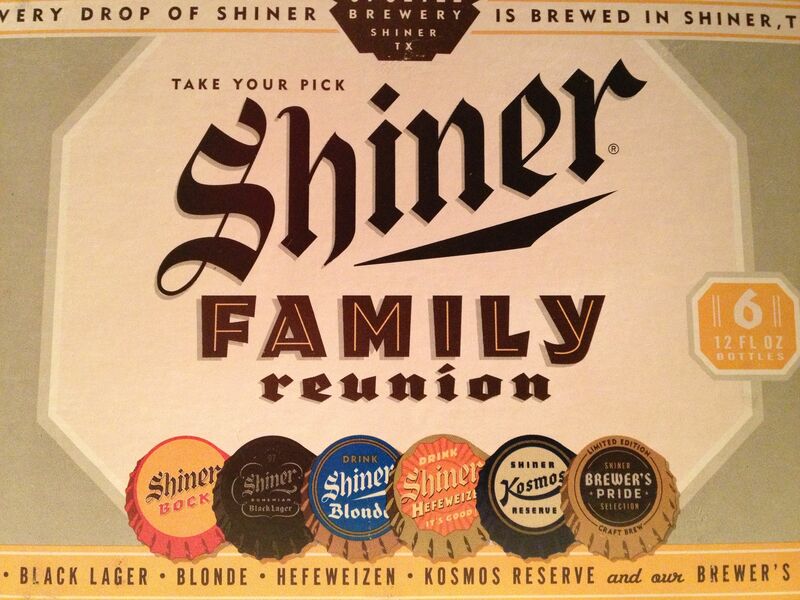 More on the miss side for me, so during the planning stages, I brought back a six pack of Shiner Family Reunion from Alabama. This six pack contained one each of: Bock, Black Lager, Kosmos, Blonde, Hefewiezen, and Brewers Pride selection. We started the tasting with the Brewers Pride selection. Part of a limited series batch, this selection was a special brew with a locally sourced ingredient: Prickly Pear. Moving on from that, we tried the Black Lager. Next in the tasting series came the Blonde, followed by the Kosmos and finally the Hefewiezen. Since I have had the Bock before, I donated my only bottle towards some future good will for the blog. 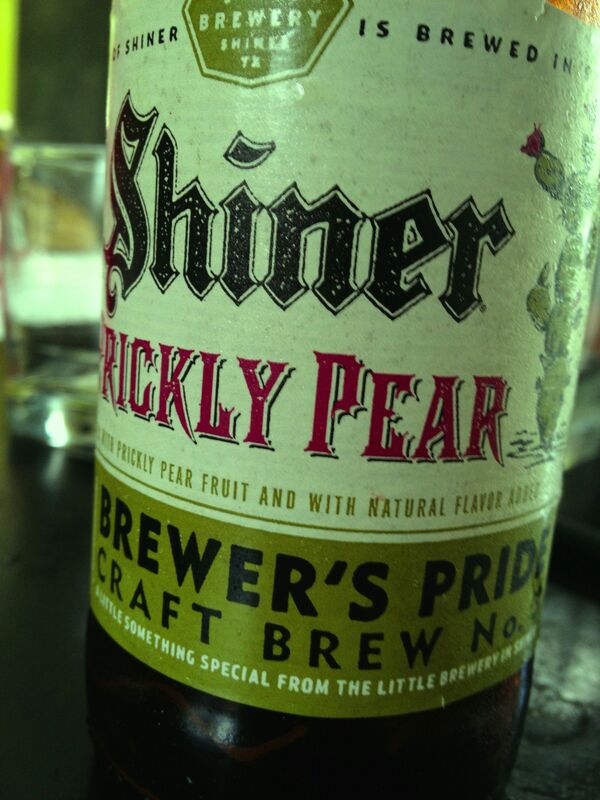 The Prickly Pear beer was different. I was expecting something similar to a fruit beer, or maybe a lambic, but this was neither of those. Cactus Fruit is said to taste like a watermelon, or maybe a kiwi, however I got none of that. The smell was sweet, but the taste was neither sweet nor sour, and it definitely wasn’t the taste of beer. Other tasters described it as a non-sweet fruit juice, and the lower carbonation sure gave off that look. This was not my favorite of the weekend, but two other tasters wanted more. The Black Lager, and frankly the Blonde, Kosmos were pretty status quo. They were all fine beers, but they lacked character. The Black Lager, my favorite of the three was fine, but it wasn’t a standout. It had a slight malty taste, but it wasn’t at the levels I would have preferred. Others stated that maybe this was a fall beer and would taste better when the air was crisp, and a fire was going. The Blonde was more champagne like, with its higher carbonation. Unlike the Black Lager, this beer was described as a refreshing beer in the heat, but nothing [flavor-wise] jumps out. The Kosmos was probably the least liked of the bunch. It has a slight sour smell and taste that didn’t mix well with the caramel-ness of the malt. The final Shiner of the weekend was the Hefewiezen. Again, this beer wasn’t anything I would be clamoring for anytime soon. A good beer, but maybe after all of these weeks of interesting, sometimes experimental, brews, I have come to cherish the unique and distinct characteristics that have become prevalent in American craft beer. An interesting experiment might have been to compare this Hefewiezen. with something a bit more mass market, like a Harpoon UFO. 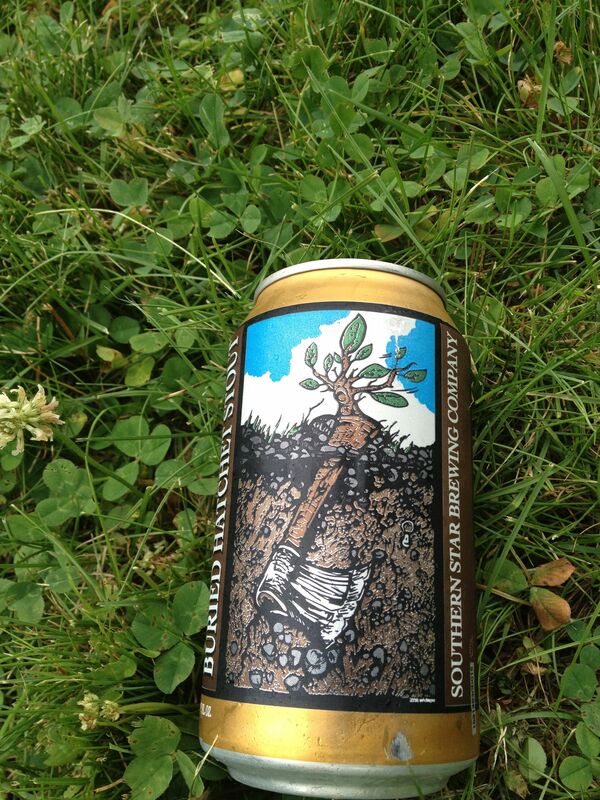 After all of the Shiner was opened, we cracked open a can of Buried Hatchet Stout. This beer was different. It had that distinct smell of roasted malt, grains and coffee, a characteristic that has been popping up over the weeks on this project. The taste was sweet and coffee-like, and it had a thick mouthfeel. Not maple syrup thick, but it wasn’t a light beer. While well liked, this beer was described as Tastes better than it smells. and Not sure I could drink a whole can of this. That concludes Texas. And while we enjoyed the tasting, we were not enamored with the beer from Shiner. Except for two tasters that will take more of that Prickly Pear if you have it. Thanks for reading. Next week Iowa.